April 24th 2016 marked Kozuki Serena’s second anniversary as a solo idol. For this special occasion, all her fans gathered in Shinjuku Ruido K4 for her third one-man live, along with a couple of special guests. This special day started off with Serechu’s signature introduction “UPPER MOON”, followed by a series of four of her most energetic yet cute songs. Serena showed that she knows how to make sure that her audience gets in the right mood in no time! It only took her a short introduction MC before getting back on track to perform one of her singles, “Kokuhaku☆Three Count”, with the same energy. It was then time for Serechu to show off her dark side and perform her rock songs! From the intense “Blackhair Hitori Asobi”, she then sang the very rarely performed “Saikyou Melody 3”. Single “Night Jungle War” was introduced with mysterious rainforest atmosphere sound effects, and the climax of this segment was reached with her cover of BiS’ “nerve”. The song was even extended for several extra choruses to make sure a maximum of fans got to interact with Serena! The final part of the main show started after an emotional instrumental piano rendering of “butter-fly”: the fans proceeded to sing all together while waiting for their idol to come back on stage in an extremely touching moment. Serena showed up again wearing her new stage costume for the first time, and sang four more of her most iconic songs in a row. It was then time for her to thank the fans in a longer MC. Seeing all the people who came to cheer for her in this special day made her think about her dreams and goals. “I realized that what was my dream up until now could now be considered a goal”, she said. She is now aiming to become Japan’s Number One Solo Idol! She also said she would like to be the kind of idol who sings anime songs and wants to tackle more acting jobs. Serena ended the main show singing her only ballad and theme song for the movie she starred in (Jyourei Tantei, 2015), “Onaji sora no shita de”, in a very touching performance as she started crying in the middle of the first chorus. Her fanclub, #SSP (Serechu Sasaeyou Project, Serechu Support Project), prepared red glowsticks to illuminate the venue at this very moment. But the fans were definitely not going to let her go easily! After a heart-warming encore call, Serena wiped her tears and came back on stage with her usual smile. As an echo to her will to sing anime songs, she performed a cover of anime Dragon Quest’s 1st opening song, “Yume wo shinjite”, originally sung by Tokunaga Hideaki. As Serena then tried to announce the title and perform her brand new song, a surprise came up! A white screen was rolled down on stage, and a VTR played for very special news that not even Serena knew about… it was announced that two of Serena’s songs were chosen to be featured on 1992 anime “Tenchimuyou! Ryo-ohki”’s 4th OVA, airing this fall! Her new song “Tenchimuyou!” will be appointed as the opening song, while “Shake the DiCE” will be heard for the ending. Serena got teary once again as she just told the audience it was one of her goals. Her manager admitted on stage that ever since she joined Rednose Corporation, they have been working in order to make her dreams come true and have her debut as an anison singer, “no matter what it takes”! As a conclusion to these very exciting news, Serena performed her new song “Tenchimuyou!” for the first time, then offered a bis repetita for “Shake the DiCE”. Some guests showed up on stage to cheer for her, including three members of idol group Dorowa Aobitto (“Doroobi”). The show ended on the heart-warming “VISION.”, all fans dancing holding each other’s shoulders like good friends. 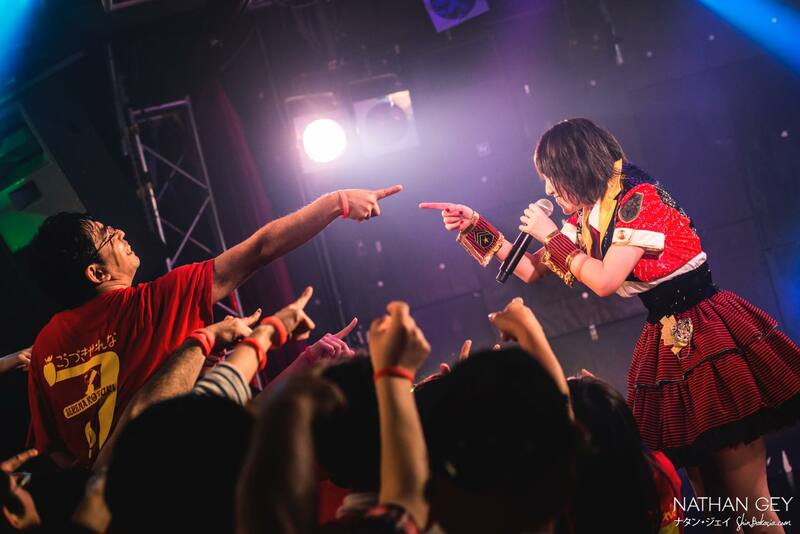 This summarized what the essence of Kozuki Serena’s performances and music is extremely well: fun, energetic songs and big smiles on everyone’s faces for a family-friendly atmosphere. Right before leaving the stage, it was also announced that Serena’s 7th single “Shake the DiCE” would be released on June 28th under youthsource records. butter-fly Instrumental Piano version intro.